Be the first to share your favorite memory, photo or story of Rhoda . This memorial page is dedicated for family, friends and future generations to celebrate the life of their loved one. Rhoda North, age 88, formerly of Blackwell passed away Saturday, April 22, 2017 in Enid. 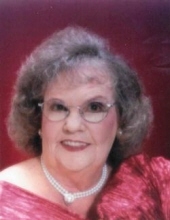 Rhoda was born August 25, 1928 in Blackwell, OK to John and Ceslie (Foster) Askren. Rhoda attended schools in Blackwell. In June of 1945 she married Ross Bradford. To This union four children were born: Rosalena, Sharon, Raelene and Johnnie. Later, Rhoda married her soul mate Henry (Hank) North and they made their home north of Blackwell. While married to Hank, She (as we all were) blessed with a wonderful new brother and his wife, Fred Lee & Cindy North. Rhoda loved to go camping and sitting around the camp fire and talking to the friends and family that showed up to enjoy the lake, fishing and camp food. She loved rolling the granddaughters hair in those pink sponge rollers (that they still talk about hating to this day!) and making them look like Shirley Temple. Rhoda worked as a waitress for many years and helped with the family farming, cooking and driving a truck to and from the fields. Her specialty was fried chicken and macaroni salad. Rhoda is survived by four children: Sharon (Jim ) Berry of Enid, Raelene (Gail) Kincaid of Blackwell, Johnnie (Elsa) Bradford Lawton, Fred (Cindy) North of California,, sister Carolyn Bascue, Tulsa, brother Bob Askren & wife Rose of Blackwell, 8 grandchildren: 18 great grandchildren and 8 great great grandchildren. Rhoda was preceded in death by her husband, parents, 2 sisters and one daughter Rosalena. A funeral ceremony to gratefully remember her life will be held at 2:00 pm, Thursday, April 27, 2017 in the Chapel at Trout Funeral Home of Blackwell with Pastor John Jack of the House of Prayer Church. Following the ceremony, she will be laid to rest next to her beloved husband Hank. The family has requested instead of flowers, donations be made to the House of Prayer Building Fund c/o Trout Funeral Home. To send flowers or a remembrance gift to the family of Rhoda Lee North, please visit our Tribute Store. Burial to follow at Blackwell Cemetery. "Email Address" would like to share the life celebration of Rhoda Lee North. Click on the "link" to go to share a favorite memory or leave a condolence message for the family.